Mommy I'm Here manufactures the worlds best wireless child locators, personal safety devices and accessories. Mommy I'm Here child locators give parents added peace of mind when traveling or out in public with small children. Simply attach the adorable teddy bear receiver to a child's shoe, belt or even use the provided velcro strap to mount where you wish. 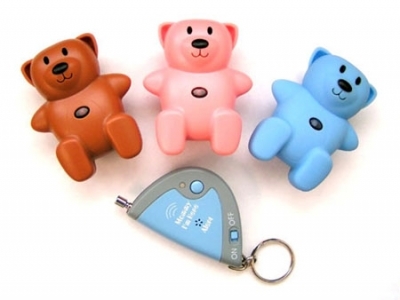 If your child decides to wander or play hide & seek without telling you, simply press the button on the tiny keychain transmitter to set off a series of loud chirps on your child's teddy to find your child from over 150 feet away!. Mommy I'm Here even makes a new version of their child locator that will even warn a parent automatically when a child wanders approximately 30 feet from them. Mommy I'm Here child locators are water resistant and come with long- life batteries already installed and ready for immediate use, right from the packaging. Mommy I'm Here; fun, easy, affordable and effective child location!